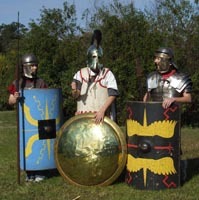 This is a military show covering the weapons, armor and tactics of these three civilizations. It also tries to look at the development, reasoning and logic behind these fighting styles. All three civilizations are covered in the show but additional emphasis may be given as requested. In the Egyptian part of the show I concentrate on the New Kingdom period, discussing its tactical advantages and problems. Discussion of the battles of Kadesh and Meddigio can be included as well as the Siege of Jaffa. 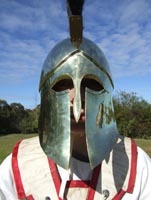 With Greece Hopilite warfare is demonstrated and the Persian Wars are discussed with the advantages of Hopilite warfare over Persian tactics explained. Phillip of Macedon and Alexander the Great can be included and the reasons for their success explained. The Roman section concentrates on the classical early imperial period. 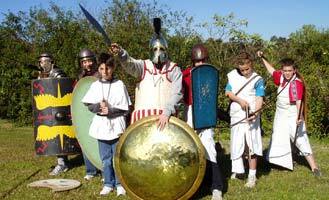 The Celts are also discussed and Roman tactics are explained as a reaction to the Celtic menace. Auxiliaries as well as Legionnaires are explained also. Chinese tactics can also be mentioned as a contrast to the three civilizations mentioned above. 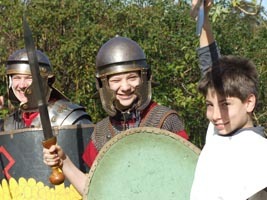 Student participation is included as part of the show with students being fitted out as Egyptian soldiers, Greek hopilites and Roman legionaries. The Ancient show can last from 1 to 2 hours as required. Shows of 2 hours or slightly less are preferred to properly cover the subject. All students are allowed to look at and handle most of my equipment during a half time break. The Ancient show can be performed in conjunction with the Medieval show & Viking show in whatever combination is desirable. Cost is $7 per head per show, plus GST (which is redeemable). Special rates for large groups and extra options can be negotiated. Preferred audience size is 40 to 150 students. Students under age 8 are not preferred. All students participating in the various demonstrations must be volunteers. Indoor venues are preferred, no sound system is required but half an hour is needed to set up and pack up.